1. For the mango sauce, combine mango, pineapple juice, lime juice, and granulated sugar in a blender or food processor. Cover and blend or process until smooth. Spoon into a serving bowl, cover, and chill until serving time or up to 24 hours. 3. Heat 3 inches of cooking oil in a deep-fryer or large saucepan to 365 degrees F. Fry wontons, 4 to 6 at a time, in hot oil for 2 to 3 minutes or until golden brown, turning occasionally to brown evenly. Use a slotted spoon to remove wontons from oil to paper towels to drain. Cool about 5 minutes. 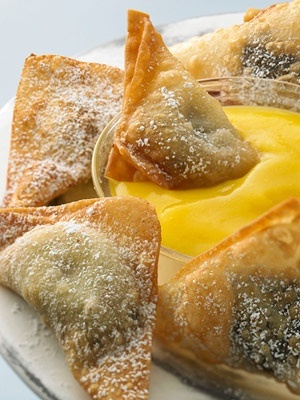 Sprinkle with powdered sugar and serve within 1 hour with mango sauce for dipping. Makes 24 wontons.